Summary: #1 New York Times bestselling author Susan Wiggs brings readers into the lush abundance of Sonoma County, in a story of sisters, friendship and the invisible bonds of history that are woven like a spell around us. Tess Delaney makes a living returning stolen treasures to their rightful owners. She loves illuminating history, filling the spaces in people's hearts with stories of their family legacies. But Tess's own history is filled with gaps: a father she never met, and a mother who spent more time traveling than with her daughter. Then Dominic Rossi arrives on the doorstep of the San Francisco shop Tess hopes to buy, and he tells her that the grandfather she never knew is in a coma. Tess has been named in his will to inherit half of Bella Vista, a hundred-acre apple orchard in the magical Sonoma town called Archangel. The rest is willed to Isabel Johansen. A half sister she hadn't heard of. Last month at book club, my friend was talking about the book she was reading and how much she was enjoying it. She couldn't remember the title, but after she started describing it, I thought it sounded awfully familiar. 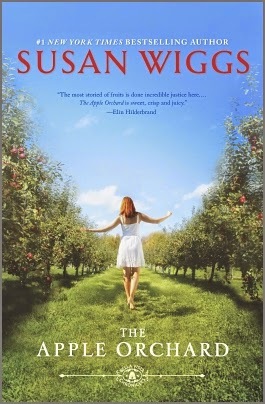 It was THE APPLE ORCHARD by Susan Wiggs and I had just received a copy that very day in the mail. At its heart, THE APPLE ORCHARD is a story about family bonds. Tess Delaney is an successful woman who works for an antique brokerage firm. She's tough, determined and just a little high-strung! Her work is the main focus in her life, and she's not exactly had a lot of luck in the man department. Tess has continually matched owners with their lost valuables and, as a result, she's expecting a big promotion at her firm. However right before her meeting, a handsome man named Dominic has some shocking news. Her paternal grandfather whom she's never met (she didn't even know her father) had an accident and is in a coma. As surprising as this news is for Tess, it's even more shocking when she learns that she is supposed to inherit half of his apple orchard in Sonoma and that the other half goes to her half-sister Isabel. (It shouldn't surprise you that Tess had no idea she had a sister either!) For a woman who grew up with only her grandmother and occasionally her mother, she always was attracted to the idea of a family. So Tess heads to Bella Vista to meet her sister and her grandfather, and truth be told, she wasn't too upset to see Dominic again. Once she arrives at the orchard, she learns to appreciate the simpler pleasures of food and family (and Dominic) while also getting caught up in finding the truth about her family and its past. In addition, Tess learns that her grandfather is in debt and she and her sister don't have the funds to save the orchard. Thankfully, her experience as an antiques dealer comes in handy as she searches for a lost treasure that might provide the assistance they need, and at the same time, give her an glimpse into her grandfather and her father's pasts. THE APPLE ORCHARD not only received a positive "review" from my friend, but it also received a starred one from Kirkus. I, too, was very impressed with this novel. It truly had a little bit of everything -- mystery, intrigue, history, romance, family drama, and even recipes! I found the characters to be well-drawn and the descriptions of the setting were terrific. In addition, I liked how much Tess evolved throughout the course of the story and the uplifting messages about family, hope, and love. I won't go so far as to say that the basic story and ending weren't a tad predictable, especially the romance part between Tess and Dominic; however, I almost expect that in a book like this one. What did impress me though, was how well the author presented the information about Tess's grandfather and father. I found these parts to be both intriguing and a little surprising, and I loved learning about Nazi-occupied Denmark during WWII. I admit when I picked up THE APPLE ORCHARD, I was expecting a book heavy in the romance department. I wasn't entirely wrong, there was a fair share chemistry between Tess and Dominic, but it definitely wasn't heavy-handed or the focus of the story. In fact, for someone who claims not to enjoy romance stories, I found their relationship to be very sweet and I was definitely rooting for them! I thought Ms. Wiggs did a great job of creating that initial attraction, showing the beginning aspects of a relationship -- both the exciting ones and the challenging ones, and then showing how they actually fell in love with each other. THE APPLE ORCHARD would make a fantastic book club selection. There is a great deal to discuss and a reading guide with ten interesting questions. Some of the themes you might want to explore include family, secrets, nature vs. nurture, love, marriage, mother/child relationships, loss, and redemption. And because the book includes so many delicious-sounding recipes like Danish Apple Pie and Lavender Scones, it might be fun to serve them at your meeting. Maybe various members could each try a recipe? I thought THE APPLE ORCHARD was a great read with a little something for everyone. Highly recommended. I've read a couple of Wiggs' books and enjoyed both of them. I find she writes with a lot of heart. This sounds like another winner to me. It's been ages since I've read a Susan Wiggs book. Thanks for the recommendation, Julie. I'll add this title to my list.